The responsibility for the illegality/unconstitutionality of 13A should be collectively borne by the then Supreme Court and the then Parliament. Sri Lanka Freedom Party organiser for the Batticaloa District Arun Tambimuttu like his late father, assassinated TULF parliamentarian Sam Tambimuttu stands up for his convictions and does not mince his words when he says that the 13th Amendment and the provincial councils need to go as the time has come to evolve a more practical system of devolution and administration in their place. 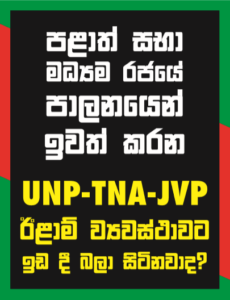 Exactly what is the UN’s game plan in continuously subjecting Sri Lanka to the wave of harassment it has been subject to increasing as a result of eliminating a terrorist organization when UN in 30 years had done pittance to bring the peace it is mandated to do? The Embassy of Sri Lanka in France has described as ‘ridiculous’ the accusations made by certain pro-secessionist propagandist websites, according to which the military intelligence was behind the assassination of a former LTTE commander in France.